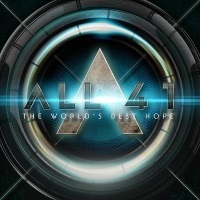 Album Review: All 4 1, "The World's Best Hope"
New Frontiers Music supergroup misses chance to be super. Every music genre has cliches attached to it that either identify or characterize it. It’s unavoidable. A barometer for success usually means either how well an artist avoids the cliches, subverts the cliches, or uses them as a tool to help with audience identification. I am pretty tough on artists who do not succeed in any of these three exceptions, and as much as I hate to do it, The World’s Best Hope from All 4 1 indeed falls down on these tasks. This is not, by the way, All-4-One, the ’90s R&B-pop vocal group that brought you the song “I Swear.” This is a supergroup formed by Frontiers Music head Alessandro Del Vecchio, featuring Terry Brock (Giant), Robert Berry (Three, with Keith Emerson and Carl Palmer), Gary Pihl (Boston), and Matt Starr. The construct is not dissimilar to another Del Vecchio production, Revolution Saints featuring Jack Blades, Deen Castronovo, and Doug Aldrich. When I first read of All 4 1’s formation, I was hopeful. There’s a lot of talent in the band, much of which has been under-utilized through the years. To me, this sounded like a promising opportunity to strike out on their own and do something interesting. Unfortunately, goodwill only gets you so far, and sadly All 4 1 buckles beneath the weight of a lot of bad choices. The main bad choice is that the sound of the music is trying so hard to reach verisimilitude with ’80s AOR/Melodic Rock that it never seems to attain an identity of its own. These are regularly heard in predictable melodies and lyrics that trade in the gray hairs of “standing for what you believe in,” and “never surrendering,” and “never giving up,” and “fighting to the end, no matter the cost.” In other words, the lyrics never rise from those of a theme from an ’80s Sylvester Stallone movie. Harder to cope with is what I will call “Final Countdown Syndrome.” I remember back in the ’80s, a friend of mine was infatuated with the Europe song, “The Final Countdown,” and bought the CD. To his disappointment, every song opened with a variation of the lead singer saying, “yeah,” or “whoa-oh,” or “ungh!” or some other unnecessary interjection. That’s precisely what you get with the majority of The World’s Best Hope, and it contributes severely to that uncomfortable sense of audio deja vu. It’s really a shame too, because the pieces are there for something a lot more interesting than what we get. In specific, I always felt like Berry had greater capabilities than he was allowed to show through the years. The Emerson Lake and Palmer fans never warmed to his presence in Three (or 3) and the sole Geffen Records release was destined to reside in cut-out bins across the nation. He contributed to some other prog-based tributes and such, but never had a platform to show off what he was capable of. The same is true of Pihl who had better fortunes working with Sammy Hagar than the famously dictatorial Tom Scholz of Boston. I will give credit where it is due: Del Vecchio knows how to plate his productions with chrome and light it up with neon. The World’s Best Hope is slick and shiny, and the musicianship involved is not subpar, but it winds up feeling lackluster, buried by those previously stated bad choices. Had there been an aggressive figure in the mix to say “this song needs another pass, it’s not there yet,” or “cut all the opening adlibs immediately,” while Del Vecchio concentrated strictly on the sound production, this enterprise would really have been something to be excited about. But as it stands at the moment, All 4 1’s The World’s Best Hope is a promise the album simply does not keep.